Welcome to the fan calculator - cfm calculator; here we will help you calculate mass flow rate and CFM of a given fan. We will introduce you to the mass flow rate equation and explain what is CFM and what CFM stands for (hint: Cubit Feet per Minute). We made sure that no fan feels excluded, from the humble battery power fan to ceiling fans including, of course, outdoor fans and many more. We will talk about why fans are useful, what kinds of fans are there, and where could you expect to find them. As a bonus, we have also included some fan facts that we think will allow you to have fun playing with fans. If you have made it through the Internet all the way to this cfm calculator, we don't think we have to tell you that fan is a rotating circle segmented into blades in a such way that when it rotates it moves air from one side of the circle to the other. But for those who wanted a definition, there it is. Because fans move air and help circulate it, they also support getting a uniform temperature within a confined space, like a room. There are many types of fans. From the personal USB fan, that you can attach to your computer, to the ceiling fans that you can find in big rooms, or even those huge fans in ventilation systems designed to cool and move air for entire buildings. Fans can take many sizes and also forms. Regarding what types of fans we expect to find in each place, we should start with the obvious: most fans exist in hot places and closed spaces. For ventilation purposes, fans tend to be ugly, big, but powerful, and optimized for performance rather than silence. Because they are generally hidden they barely ever serve any aesthetic purpose. On the other hand, ceiling fans tend to be quiet since, apart from the obvious function of moving air, they should not disturb people having conversations under it. Finally they should, at the very least, not detract from the appearance of the room they are located in. We also have bathroom fans which could fall into the ventilation category since bathroom fans are barely ever meant to be seen. The best known are outdoor fans and standing fans like the ones you would pull out on a hot summer day in hope for some refreshing breeze. They strike a balance between mass flow rate (don't fret, we will explain later what is it) and noise. They are also available in a wide variety of designs, sizes and prices. Here we can include computer fans easily, both, the fans used to cool it, and the USB or battery powered fans that cool you. The last type of fans that you can find are sports fans, but those are not very efficient at moving air and make a lot of noise. Hereafter we shall not discuss such type of fans. Now that we have talked about the types of fans and their places, it's time to talk about the things that make one fan different from another. Size - Parametrized by the diameter of the circumference the fan covers. RPM - Revolutions Per Minute. Rotational speed of the fan. Blade shape - Depending on the design of the fan blade a fan can be optimized for air pressure, or airflow. Efficiency - Is the ratio between power input and power output expressed as a number between 0 and 1. This distinction between airflow or pressure optimization of a fan is important in some aspects, but is also very hard to parametrize, which is why it's left out of this fan cfm calculator. The idea is that an airflow optimized fan will be better for moving significant amounts of air in an unrestricted scenario, i.e., when there's nothing close to the fan that may obstruct the flow. On the other hand, pressure optimized fans are designed for situations in which there is an object blocking the airflow like a radiator. Hence, higher pressure is required to avoid the flow of air being completely obstructed. The way pressure is mentioned and used in the fan world is reasonably standard, and does not call for the use of exotic measure units. However, when we are talking about airflow being a more complex quantity than pressure, there are certain remarks and special units that should be used. In particular, in the fan world we use the term "mass flow rate" and unit called cubic feet per minute (CFM). So let's take a closer look at these concepts before we can start using the calculator. The term "mass flow rate" refers to the amount of material that passes through the fan per unit time. The mass flow rate mathematical definition is: dm/dt which is the derivative of the mass with respect to time. The unit of measurement for the flow rate is CFM which stands for Cubic Feet per Minute. It might sound a bit strange since cubic feet is a unit of volume and not mass or weight. However, if we use the density of whatever substance is going through the fan, we can easily convert volume to mass. This requires you to know one more information about the medium in which the fan will operate. That's why SCFM exist. SCFM stands for standard CFM, and it's a measurement of CFM for a gas of fixed density. The premise is that the gas is in what chemists call standard conditions, which are a set of temperature and pressure that are representatives of the ordinary, everyday values. Generally, when people ask "What does CFM mean?" they are usually asking about SCFM since that's the specification that fan manufacturers quote. Back to our cfm calculator, it has 3 different fields you can fill in normal mode; but if you're able to fill the three of them, you don't really need this calculator, do you? 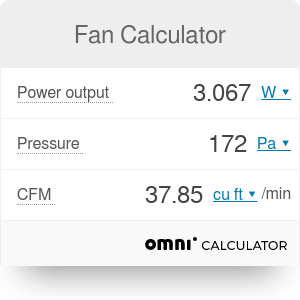 We created this calculator for estimating CFM of a fan, give the pressure it generates and the power output. For completeness, we have also included an advanced section in which you can calculate the output power using the efficiency and the electrical parameters of the fan. Use the advanced mode to calculate the power output using the voltage, current and efficiency of the fan. This is one of many uses we can think of for this calculator. However, you should feel free to use the calculator to obtain any other parameters of the fan that you might be missing. What this means is that if you know the airflow and pressure, you can calculate the power output of the fan, and even the efficiency (assuming you know the operational voltage and current of the fan). Feel free to explore and use the fan calculator according to your needs. You might be thinking that fans always work on air. And that's reasonable since most of the examples we've talked about (ceiling fans, bathroom fans, USB/battery powered fans) work like that. But actually, water-fans are a thing. Think about the propellers on a boat. They are indeed indistinguishable from regular air fans. The reality is that they work on the same principles as everyday fans, namely the Bernoulli principle. What makes them different is the use of the third of Newton's law to move a boat instead of move the air/water around them. A very creative way to use a fan. Another clever use of fans is to use them in the opposite way of how they are designed to work. Instead of moving the blades of fan electrically, you let the moving air spin the fan and take the advantage of that situation. This is exactly how wind turbines and dams generate electricity, you just need to put the right electrical circuit. To correctly predict the viability of these infrastructures, you need engineering knowledge well beyond what is CFM or the mass flow rate equation, obviously. However, if you resign from the electrical circuit, and instead have a fan spinning freely as the air moves through it, you just made yourself a wind speed measuring device. And the best part is that you don't even need to know what does CFM mean. Simply put outdoor fan wherever you wish to control the wind speed and look at it. The faster it spins, the faster the wind is and the higher the CFM is at that moment. You can even do by yourself one of these fans if you wish so. A quick search on Google will help you. We hope you learned something fun with our fan calculator. We don't know about you, but we think that this is the most fantastic of all OmniCalculator's calculator. Fan Calculator can be embedded on your website to enrich the content you wrote and make it easier for your visitors to understand your message.